in part 2, we take the same xaml, but this time compile it into a managed assembly for consumption in a silverlight 1.1 application. 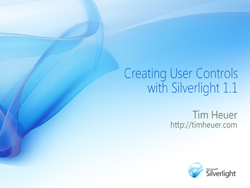 the result is that we now have a modular approach to reusable components in silverlight and the user control in managed code also affords us familiar implementation style similar to asp.net user control syntax. rather than only relying on code, we can implement the control directly in the xaml using syntax like <mynamespace:mycontrol />. the code for part 2 is found here: Screencast.SilverlightControls.zip. as always, feedback and more suggestions for future screencasts are appreciated!